Brake Lights not working, everything else is!!! Thread: Brake Lights not working, everything else is!!! Ok, just like the title says, I have running lights (both L&R) and also directionals (both L&R), I am going freaking bonkers trying to figure this out! I have changed out the flasher, brake light switch, checked all fuses, and nothing is helping the situation. All grounds are grounded, and I am out of thoughts. Any input would be greatly appreciated. Thanks. Re: Brake Lights not working, everything else is!!! Not completely related, but I'm having the same issues with a '96 Explorer. Fuses, brake light switch, etc is good. I have power(checking with testlight) going into the stoplight switch, and power coming out when pedal is depressed. From there, the wire gets lost in a huge bundle of wires under the dash, that I can't follow. The correct wire in the harness, running along the door channel, has no power running through it. So, there's something between there, and the switch. I just have to find it. So, I say, start tracing the wires, and see where power stops with the pedal pushed. Not sure on your Jeep, but an old Ford mech told me the wire from the brake switch runs up into the steering column to the turn signal switch, and emergency flasher switch. Must find a wiring diagram! Probably wasn't much help, but maybe it'll help some. And hopefully somebody else here can give us a better steer! Iâ€™d take a look at the bulbs. The brake light and the turn signal elements are different. Use a test lamp to check the circuit on the brake switch going to the rear of the Jeep. 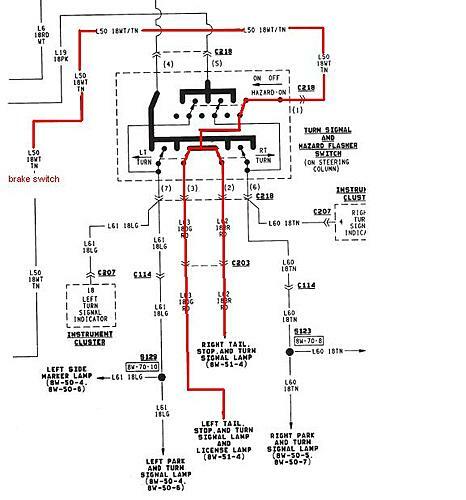 If there's 12v on the switch, keep following that circuit to the rear until you find an open circuit. It could be just the harness connector on the body to the rear harness. Have you checked the wiring connection at the top of the brake pedal? I somehow managed to kick mine off one day and it killed the reverse and brake lights. 89 YJ. 5 spd. 258i6. Chronically depressed and regularly attempting suicide... with me inside! wow pain to follow the wiring diagram but here goes. one wire goes to the high level brake lights or soft top it goes to a door mounted brake light if installed. if you have a high level or center mount the light should work if the fuses are good and the door is shut. other wire goes to steering column hazard switch then to turn switch and on to rear lights. as posted before the brake and flasher are the same wire so the lights flash the wire is good. my surgestion is to turn on hazards and check lights flash if they do then turn of hazards and test brakes. if brakes dont work then the hazard switch is most proberly the problem. 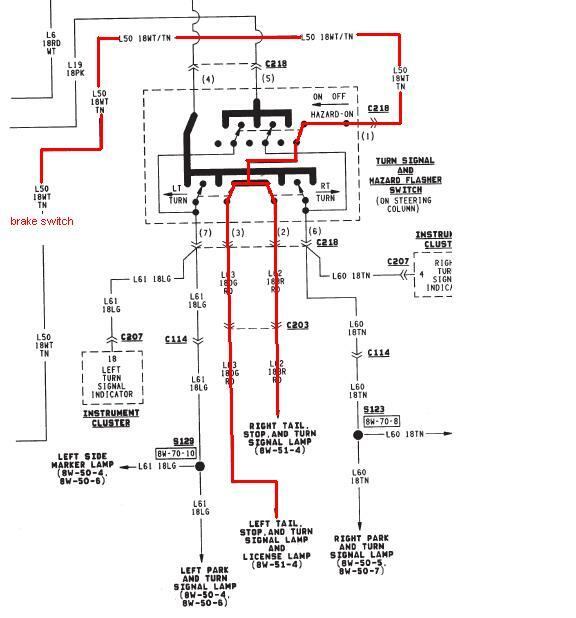 i have a pdf of the yj 95 wiring diagram if you need one. Ok, so this would be the piece inside the column then correct? I think they sell them special order at Autozone for 24.99, basically a harness I'm changing out. John, yes it is a 94', I figured I would have to take off the steering wheel, but yes I have check the power on the brake light switch and it's there, just a no go on the brake lights. This is driving me crazy. you'll get it just go over everything again, i know how frustrating it is..
Ok, So briefly last night as I was leaving, I haven't had the chance to check anything etc. No wires messed with nothing, all I've changed out was the brake light switch, my brake lights worked momentarily then a little ways down the road, out again! While they were working though I did manage to reach down under the dash and unplug the brake switch and the brake lights didn't work then plugged it back in and the brake lights were back working, so the switch is good. What now, any suggestions??? Check the terminals for corrosion and the switch for proper adjustment. All, thanks for the input, after a day of tearing the Jeep Dash out for a gauge rewiring, I searched for the brake light wire from the brake light switch and low and behold I followed it through the harness and I found where it had rubbed against the dash frame and was grounding itself out. Thanks again everone for the suggestions. Ok! Now I only have one light, driver side work, passenger side no worky! Any ideas? Thanks in advance. I realize I'm three years late on this thread, but I'm new to Jeeps (and most mechanical work) and am having the same issue. Please forgive the ignorant question, but what is meant by "check the grounds"?